Home office conversion is a lot more than it sounds like. While it seems like it’s a cinch, the home office conversion process is a lot more involved. This is due the fact that a home office and bedroom have two completely different functions. Which ultimately means you’ll need certain elements for the makeover to actually serve as a useful home office space. 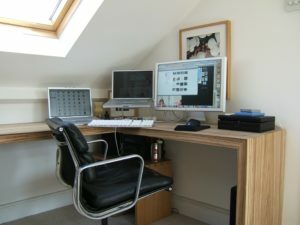 Before you jump into a home office conversion, you should first take serious consideration about what that means. Most importantly, what the makeover will mean when it comes time to sell. You see, at resale, buyers will almost certainly object to such a conversion. Not because they don’t like the idea of having a dedicated office space but because it’s no longer a bedroom. In fact, one of the biggest buyer objections is a bedroom that’s no longer a bedroom. (Or, a garage that’s been converted to a living space.) While attic conversions and basement conversions are seen as a big plus. So, be sure that you’re taking this factor into account. Choose and arrange furniture. If you don’t have the furniture (like the desk, chair, sofa, and more) already, take the opportunity to choose furniture that’s the right size. Scale will make huge difference, as will placement. You’ll need to arrange the furniture to maximize traffic flow and attempt to capture a view. Strategically place the computer and any peripherals. Try different places for the computer and its peripherals. This will take a little trial and error to get it right. Then, hardwire all devices for optimum performance. Proactively protect the floor. You’ll probably choose a rolling chair. That’s find because it gives you more freedom. But, it can easily damage the floor, as well. So, use a floor protector to avoid any damage. Be sure to add enough light. An office space needs more light than a regular bedroom space. Be sure that there is ample light, using both natural light and interior lighting to have enough, regardless of the time of day. When you need junk removal for your home office conversion, phone 800-433-1094 or visit Junk Garbage Removal.